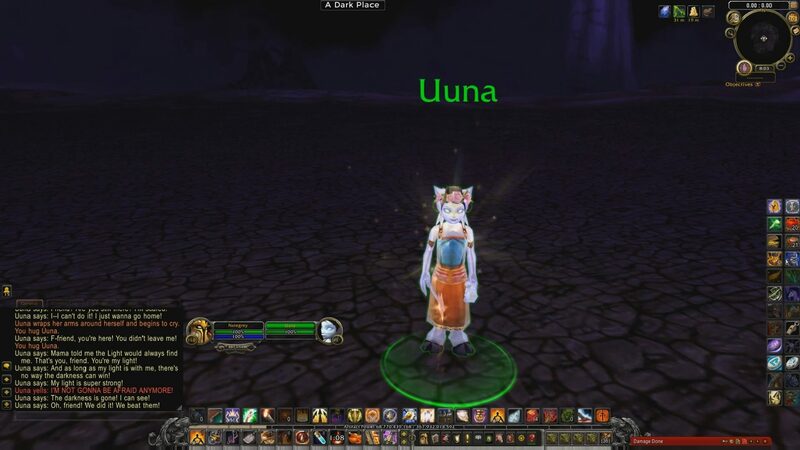 Uuna is a non-combat pet with no rewards other than itself, and the journey to upgrade her into a loving companion who hugs you back. It is also the only pet that requires a lengthy step-by-step guide akin to the Secret Mounts in World of Warcraft: Legion, and she has her own mini-scenario as well. 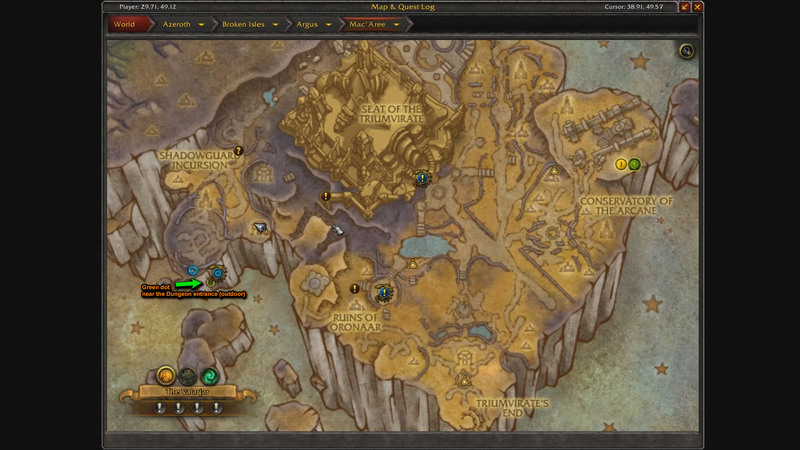 Access to Antoran Wastes unlocked. Let's begin with two required addons (if you don't have them installed). Quit World of Warcraft. 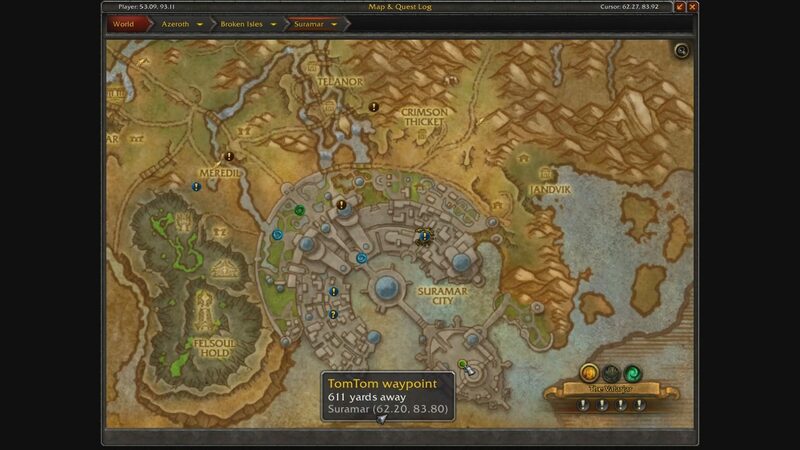 Download these two addons: Accurate Coordinates and TomTom. Follow both links to download them. Launch the game, and make sure to enable outdated addons at the lobby screen where you choose which character to play as. 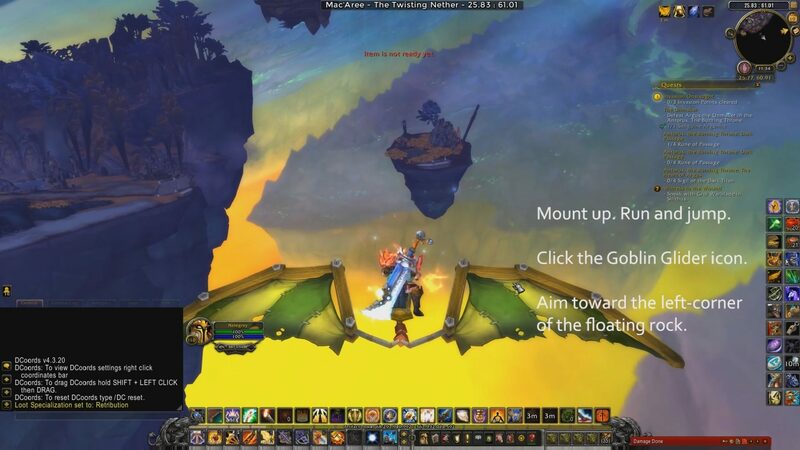 Teleport to the Antoran Wastes in Argus. This takes any time up to 10 minutes of farming until Call of the Devourer drops. You will find a Fiend Bone on the ground. Next one is to the south, across the fel river. 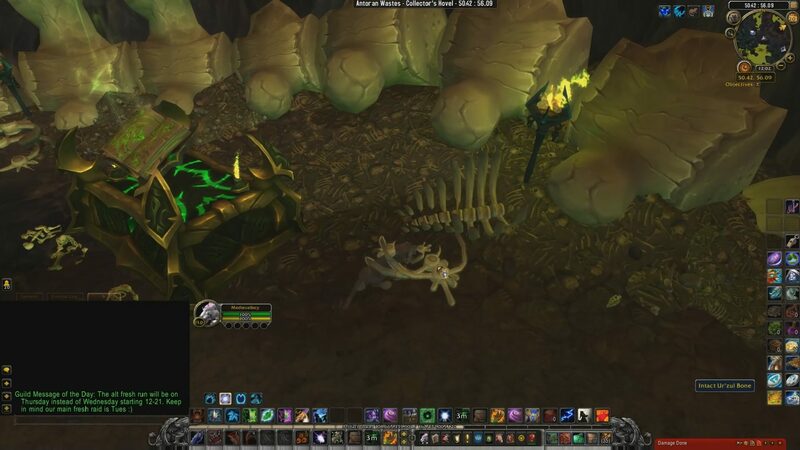 You will find the Ur'zul Bone at the right-side of the altar at Collector's Hovel. Go inside the cave. 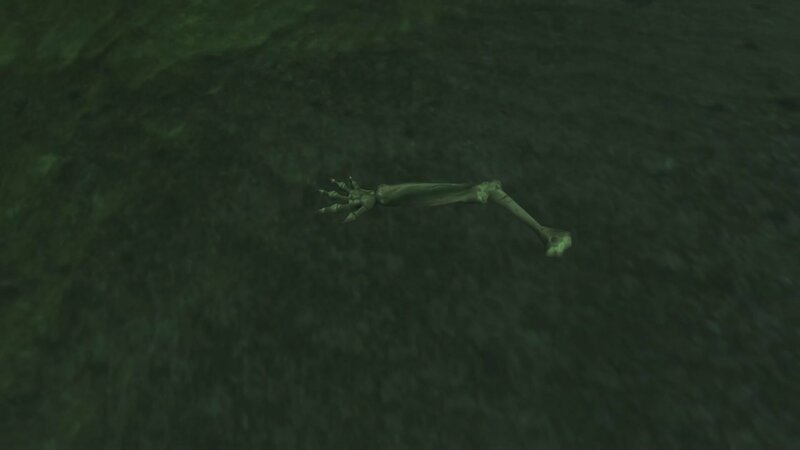 At the second Imp Mother, on the ground you will find an imp arm bone. 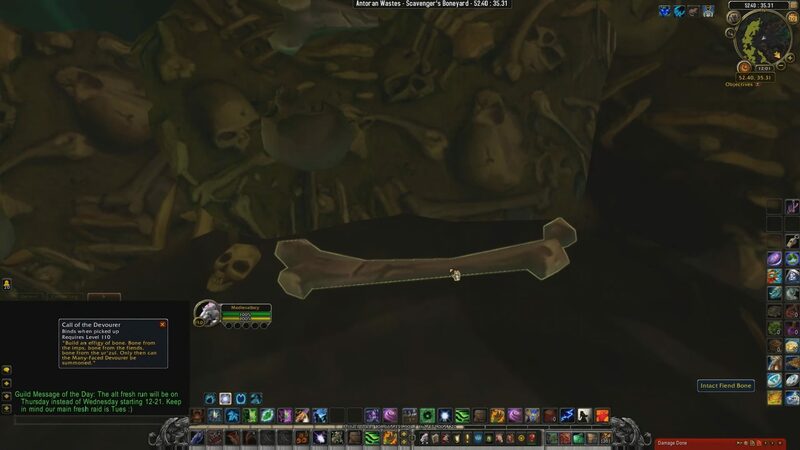 Click the Bone Effigy (marked as a green silohuette to place the bones there. The bones are now visible. Click the bones to summon The Many-Faced Devourer (Rare Elite). From this moment forward, you no longer need to collect the bones ever again. You just come to the Bone Effigy each day to summon the boss. Uuna is not a 100% drop rate. Chances are you might have to summon this boss each day until Uuna drops. 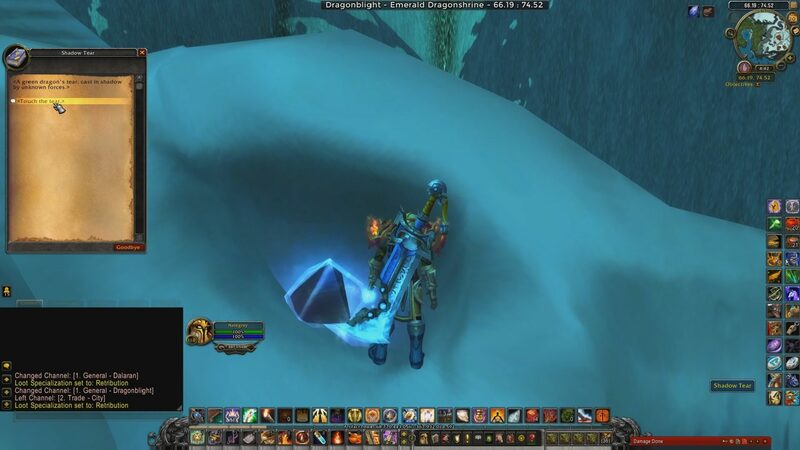 On Jan 18, 2018, Blizzard hotfixed Uuna to increase its drop rate. Eventually, you will loot Uuna's Doll. That item teaches you how to summon Uuna. 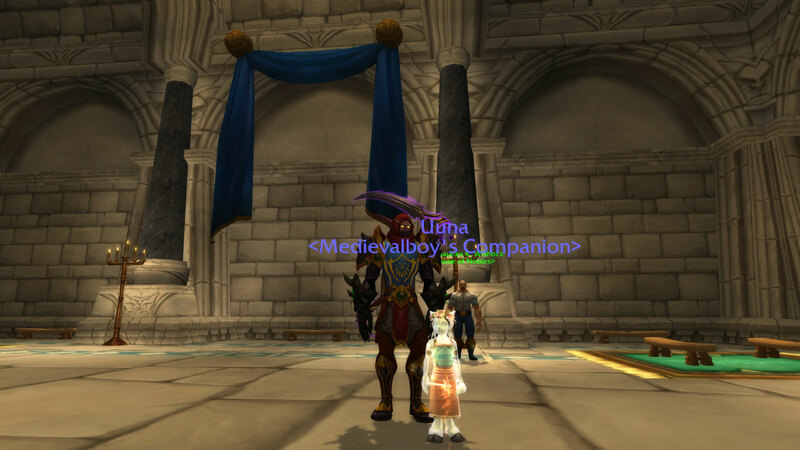 She is a non-combat pet in your Pet Journal. Drag the summon button to your spellbar. This will make Uuna flee in terror, and she despawns. Uuna: "Are you sad too? Are you lost like me? At least we're together now. We just... don't know where we are. But you're my friend, and I know it's gonna be okay. I wish I could see better. It's always so dark here!" Click the Dalaran Hearthstone. The journey begins. 1. In Dalaran, go to your Faction District. Take the portal to Vale of Eternal Blossoms (Pandaria). 3. Take the portal to Shattrath City in Outland. 5. Approach A'dal (the naaru). Uuna: "What's that? A light in the darkness! It's so bright... It's too bright! Too bright! Owww!" 6. Uuna will flee away and despawns. 7. Turn around (to the southeast in the mini-map). You will see your faction's portal. Click it. 1. 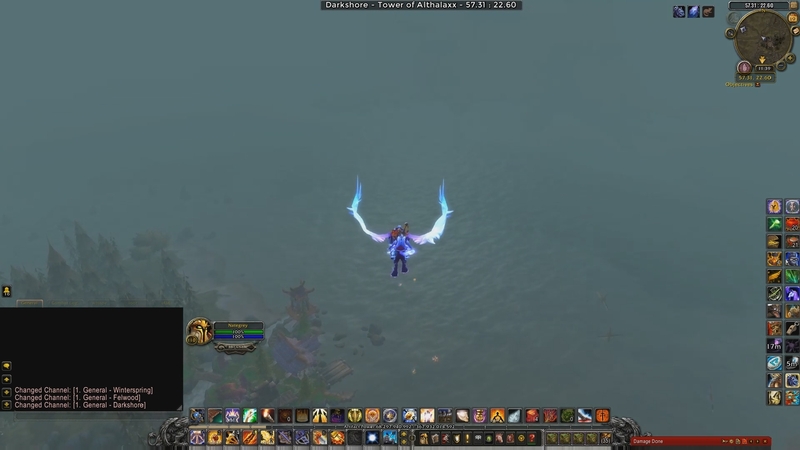 HORDE: Fly northwest toward Ashenvale. You are heading west of Maestra's Post, to Lake Farathim. Uuna: "It's gotten a little brighter! I can see... sorta. Oh, hi! Who are you? I'm Uuna. Wanna be friends? Maybe together we can get outta this place. I wish Nuu were here. He'd know what to do." 4. 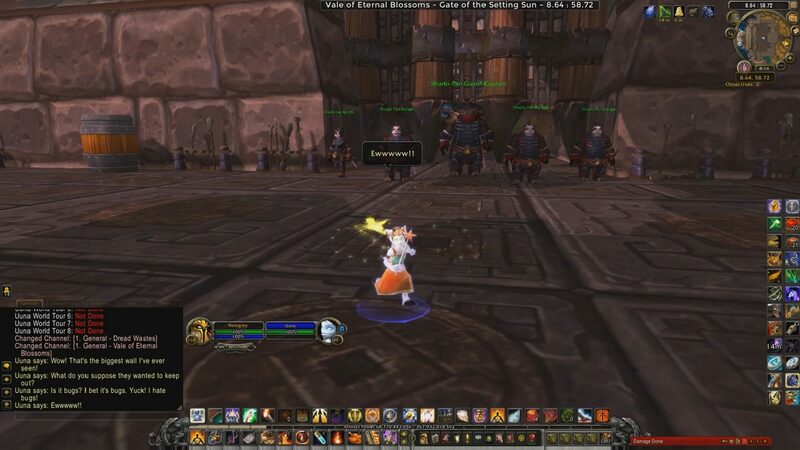 Click the Vindicaar Hearthstone. NOTE: You might have to go to the Auction House if you don't have a Goblin Glider. Get two Goblin Glider before doing the next step. 1. Take the Portal to Argus. 2. 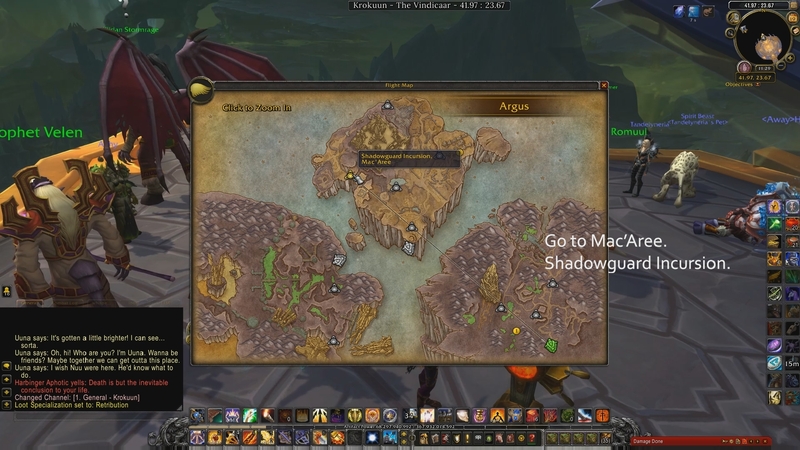 Take the flightpath to Shadowguard Incursion (Mac'Aree). 4. Stand near the corner, align yourself in the direction of the floating rock, mount up and run forward. Jump and click the Goblin Glider icon to land on the floating rock. 5. Wait three minutes until the Golbin Glider's cooldown is over. 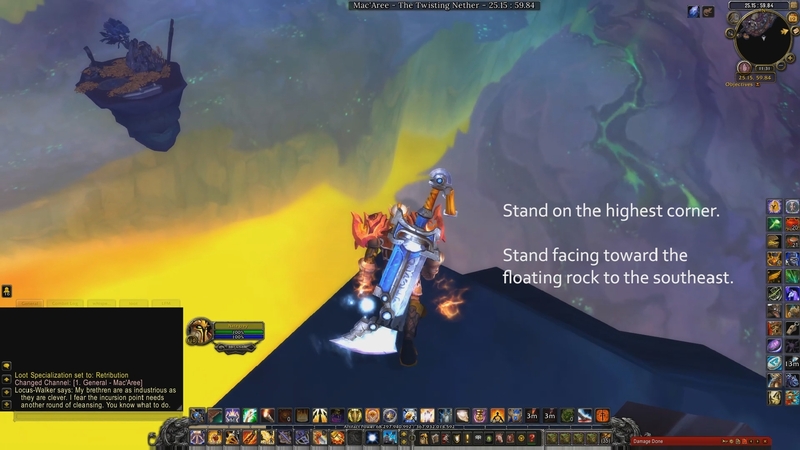 Stand on the highest corner of the floating rock, and aim in the direction of the next floating rock see in the distance. 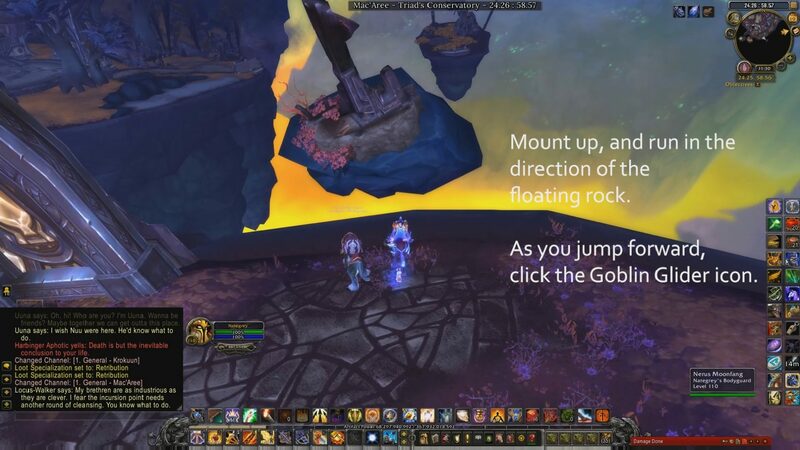 You are going to aim to land on the left-side of the next next floating rock. Step back a few yards. Mount up. Run and jump. 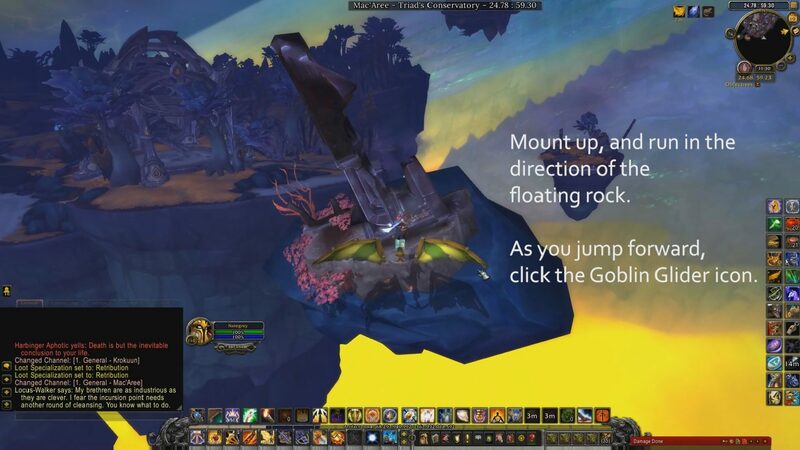 Click the Goblin Glider icon and soar. 6. Summon Uuna. Go inside the house. Walk by the table until Uuna picks the doll. Uuna: "Nuu-Nuu! I was scared I'd never see you again! How did you get here? Nuu is here to help us, friend. I knew you'd find us, Nuu! I'll hold onto him so he doesn't get lost again." 7. Click the Dalaran Hearthstone. 1. Go to your Faction District in Dalaran. 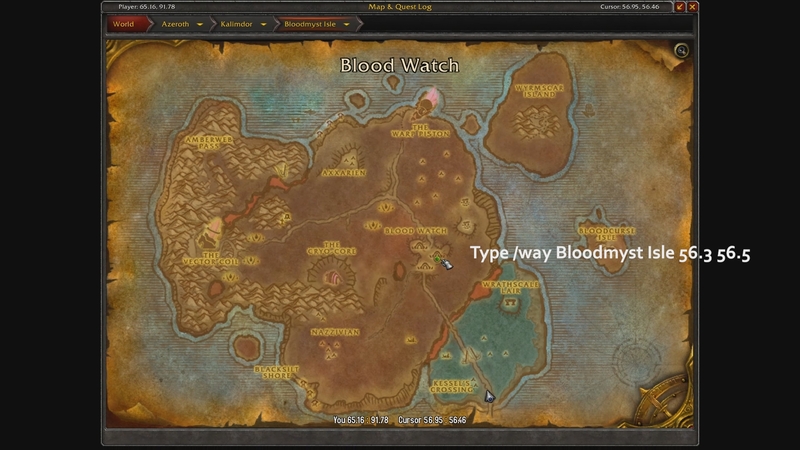 ALLIANCE: Ride to Bloodmyst Isle or take the flightpath to Blood Watch. 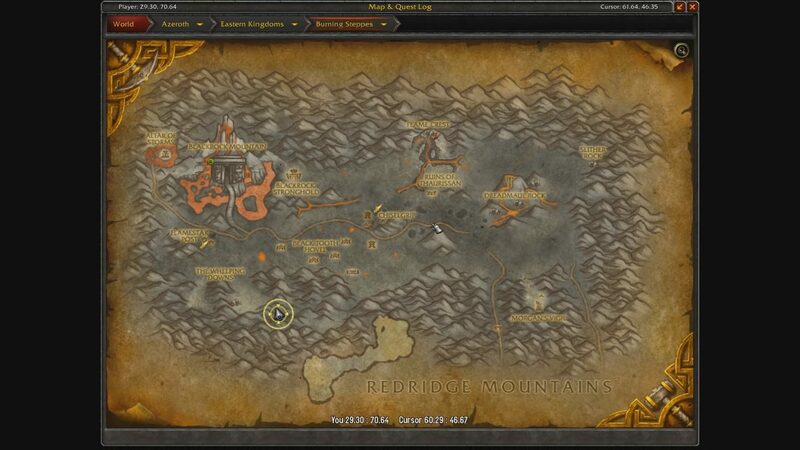 HORDE: In Orgrimmar, fly to the Western Earthshrine and take the portal to Mount Hyjal. 4. 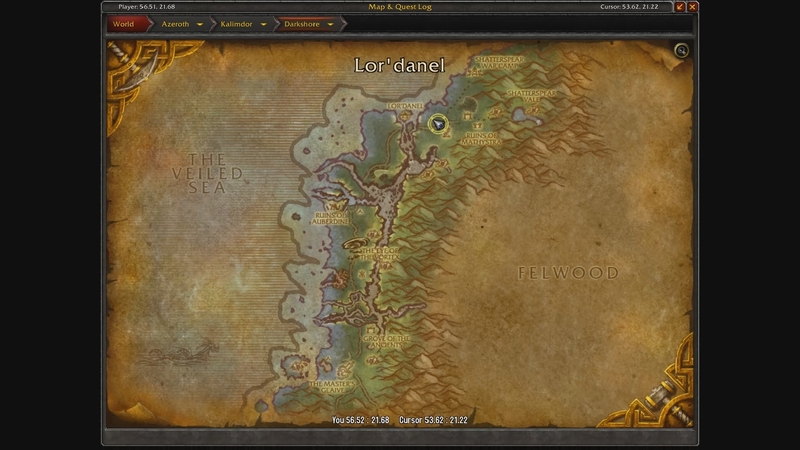 HORDE: Fly northwest toward Lor'danel (Darkshore). 5. HORDE: From this point, you can fly toward Teldrassil safely without dying to fatigue. 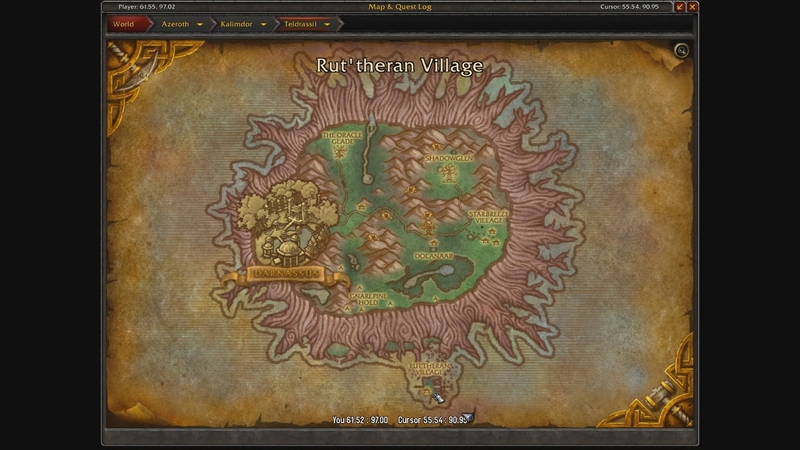 Reach the Rut'theran Village (port). Go to the westernmost port and take the Elven boat to Azuremyst Isle. 6. HORDE: In Azuremyst Isle -- NOTE: Don't get too close to the crystal gates of Exodar or you get flagged for PvP. Circle around toward the east... far from the gates (in the map: the yellow icon on the lake). Go to the northernmost road of Azuremyst Isle, and go through the bridge to reach Bloodmyst Isle. Summon Uuna. Behind that spot is a table. 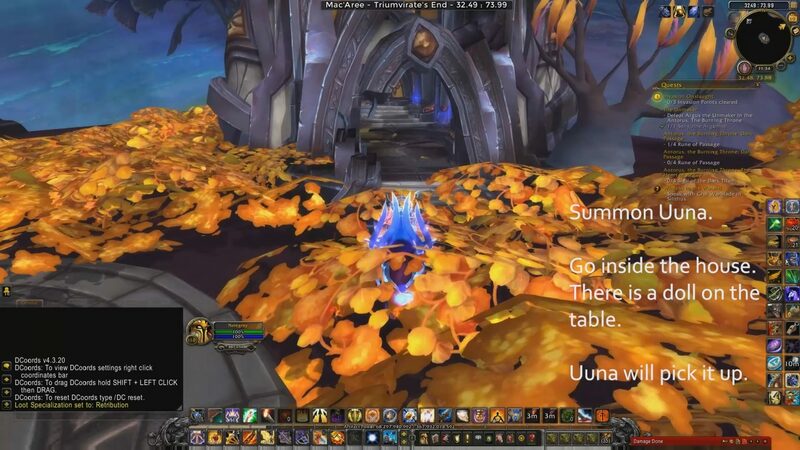 Slowly walk to the table (located in front of Jessera of Mac'Aree) until Uuna talks. Uuna picks a wand from the table. Uuna: "I used to have a wand like that! Lost it a long time ago. It shoots stars! Bad guys really hate that." 9. 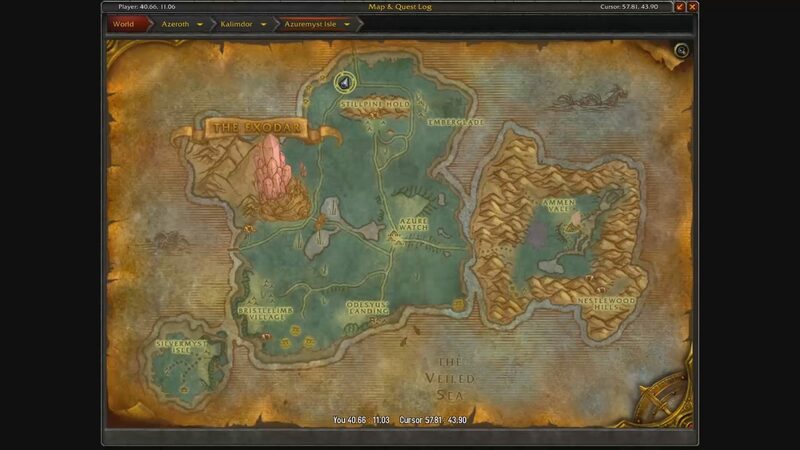 Click the Garrison Hearthstone (Draenor). 1. 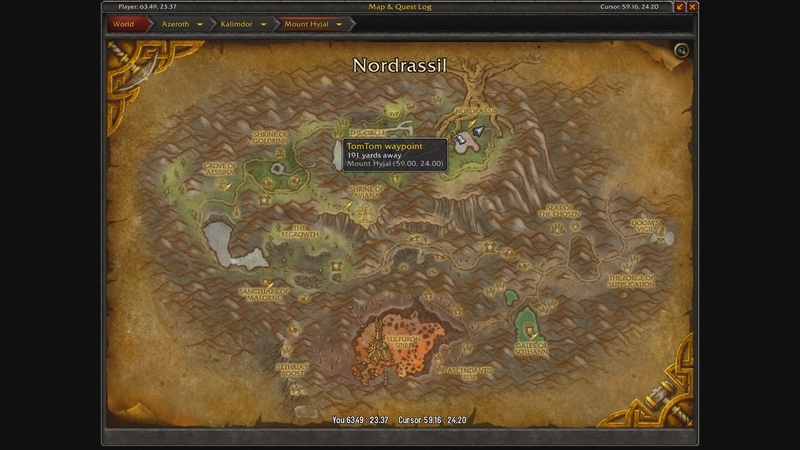 HORDE: In the Garrison (Draenor), take the portal to Ashran. Fly west toward the coast of Tanaan Jungle. 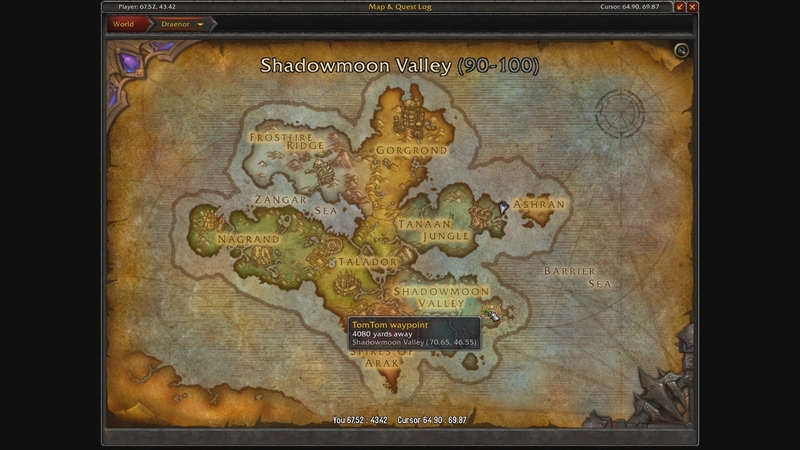 Once you reach the coast, fly south toward Shadowmoon Valley. 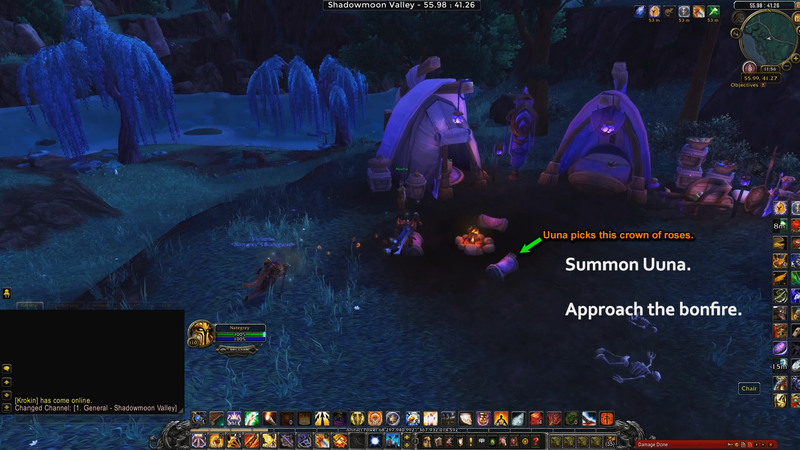 ALLIANCE: Your Garrison is in Shadowmoon Valley. Skip to step 2. 3. Summon Uuna. Walk by the bonfire. Uuna will pick a crown of roses from one of the seats surrounding the bonfire. Uuna: "A crown! So pretty! You can't fight the dark without a crown, friend. It's the rules. I feel a lot better now." 4. Stand still and wait for 2-3 minutes until Uuna talks and she is kidnapped by void tendrils. Uuna: "It's dark again! Where did you go? Don't leave me! No! Let me go! Help, friend! HELP!" 5. Fly up high. Dismount and die. Click the button: Release Spirit. 6. 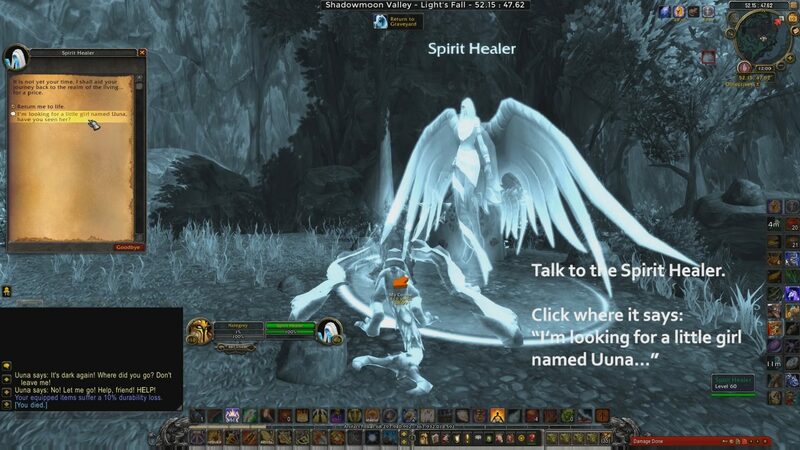 Click the Spirit Healer, and click where it says: "I'm looking for a little girl named Uuna, have you seen her?" The Spirit Healer will respond: "I have heard the cries of the child you speak of. I shall mark you, that you may pass into this realm and seek her out. She resides in a place where the barrier between the realms of life and death are thin, and spill over into your world. Be warned, you have no power in this place, its denizens cannot be harmed by mortals. Try as you might, you may not be able to aid your friend." 7. Fly back to your corpse to resurrect. Then click the Dalaran Hearthstone. 1. In Dalaran, go to the Chamber of the Guardian. 2. 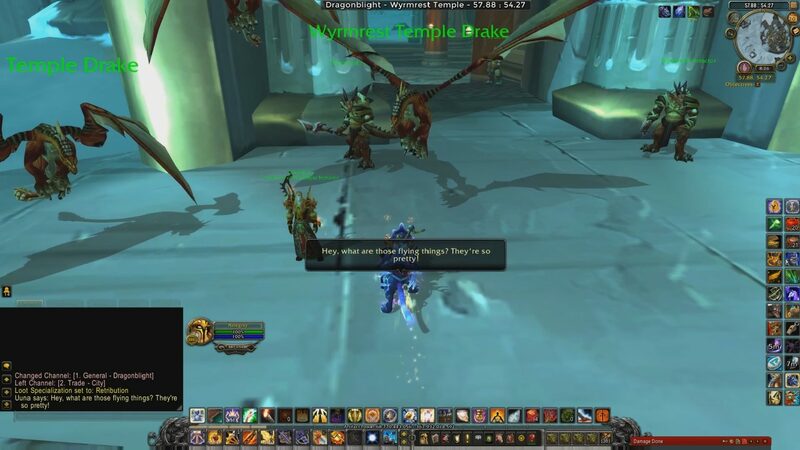 Take the portal to Wyrmrest Temple (Dragonblight). This takes you to the Emerald Dragonshrine. 4. 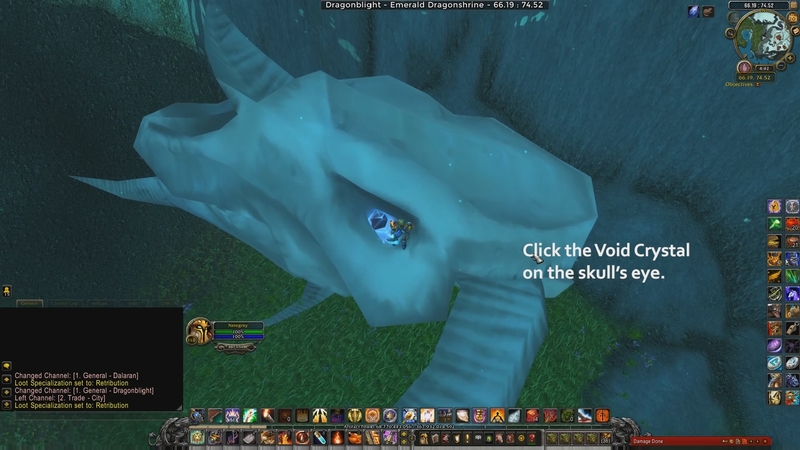 Click the Void Crystal located in the eye-socket of a dragon skull. "A Green dragon's tear, cast in shadow by unknown forces." Click where it says: "Touch the tear." You are teleported into a scenario named DARK PLACE. 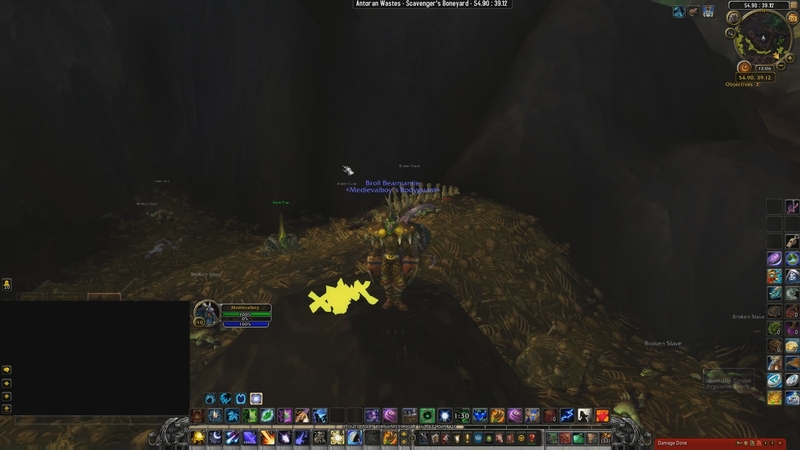 TIPS: Good idea to bring Movement Speed gear, enchantments, and food. 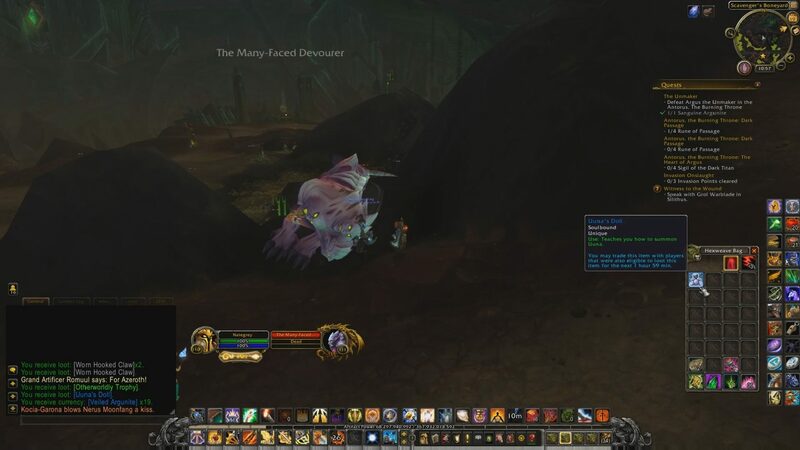 My repertoire included: Strand of the Stars & Chrono Shard (Mythic versions), Aggramar's Stride (Legendary), lowbie Cloak with +100 Haste + 2% Movement Speed (Enchantment: Gift of Haste). 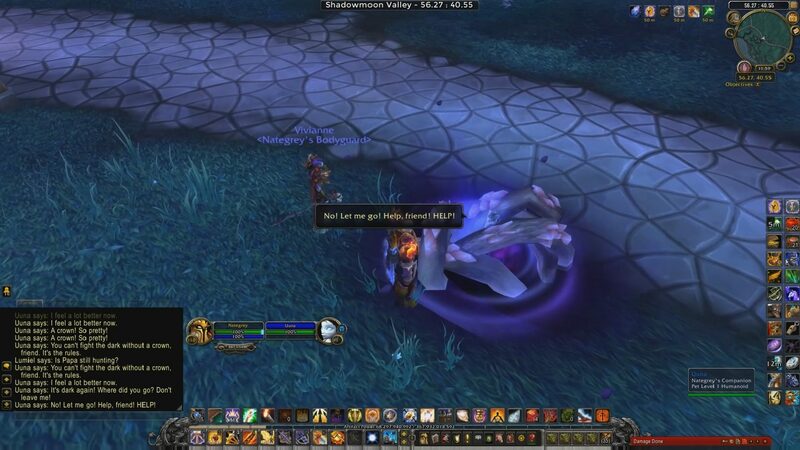 Consumable Food: If you have the Aggramar's Stride Legendary Boots open your character Tab and see what stat is higher: Critial Strike, Haste, Versatility, or Mastery. Pick the food from below appropriate for the highest stat in your character. The Aggramar's Stride increases your movement speed by 75% of your Haste, Critical Strike, Mastery, or Versatility, whichever is highest. If you are missing any of these, try other alternatives for passive and active Movement Speed increase that doesn't involve attacking mobs. You can't attack the Soul-Eater mobs. You probably have the Man'ari Training Amulet (Heirloom) as an alternative to Chrono Shard/Strand of Stars. 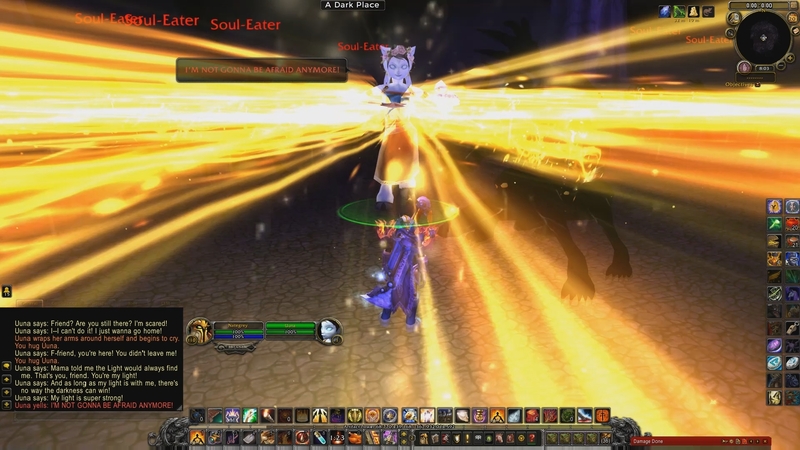 Use active Movement Speed abilities toward the end when the Soul-Eater are coming close to Uuna. 3. 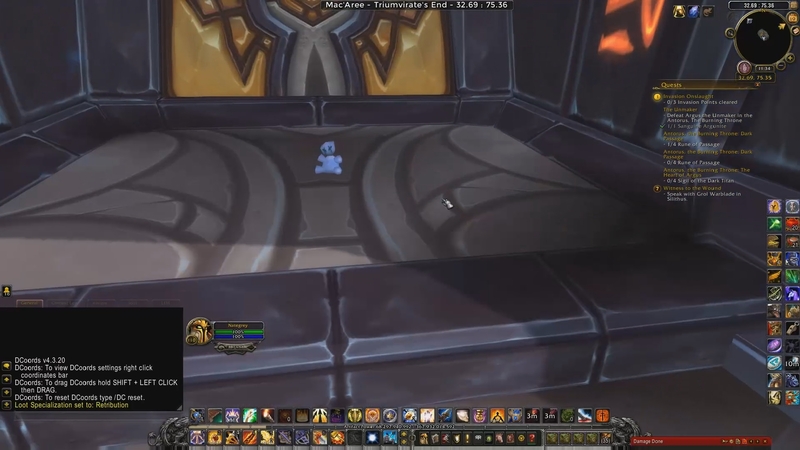 Drag the Macro icon into your spellbar. Assign a keybind if you wish or if you are a clicker put it on the secondary spellbars. Test the Macro works. You will see in General Channel the following: "You hug Uuna." Uuna: "Friend? Is that you? I won't give up, friend! I promise! I'm just so cold, and it's very dark here. I don't know what to do!" 5. After Uuna finishes that line of text, open your Spell Book, and choose the PROFESSION Tab. 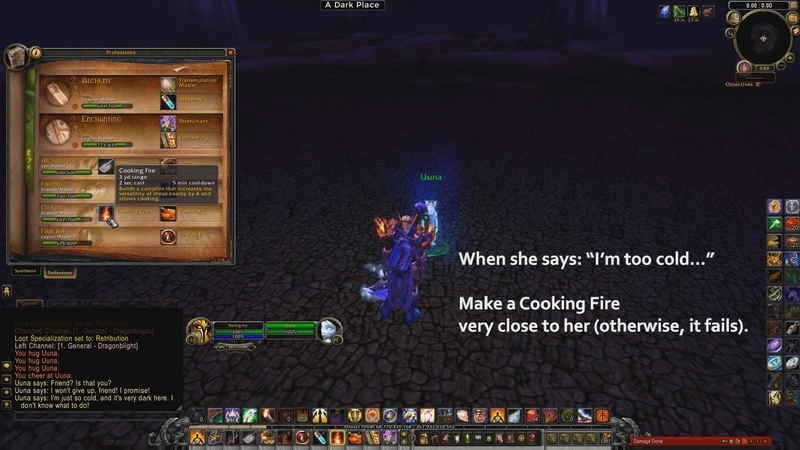 Click the "Cooking Fire" icon and place a bonfire NEAR Uuna. If you place it too far she won't come to the bonfire, and you are left waiting for a 5 minute cooldown. Uuna: "There you are! That's much better. They're gonna be here, soon, friend. I keep running and running... but they always find me. But now you're here. Together we can fight them! I think... Promise you won't leave me, friend. Even when it gets dark... They're here..."
6. 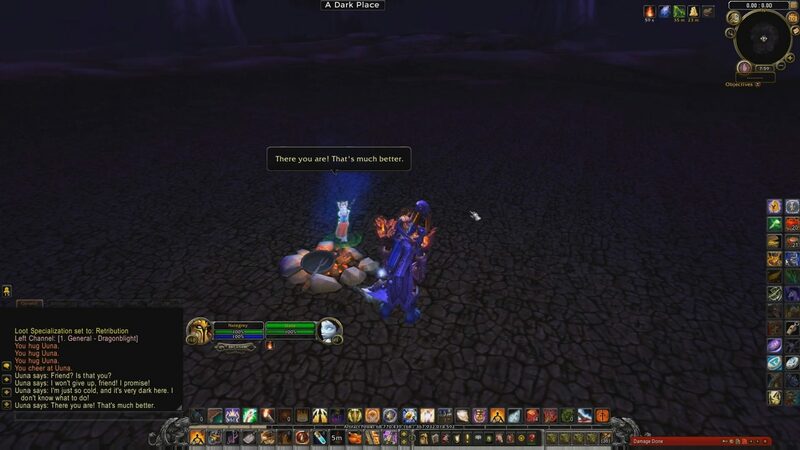 When the bonfire despawns, the Scenario event starts. 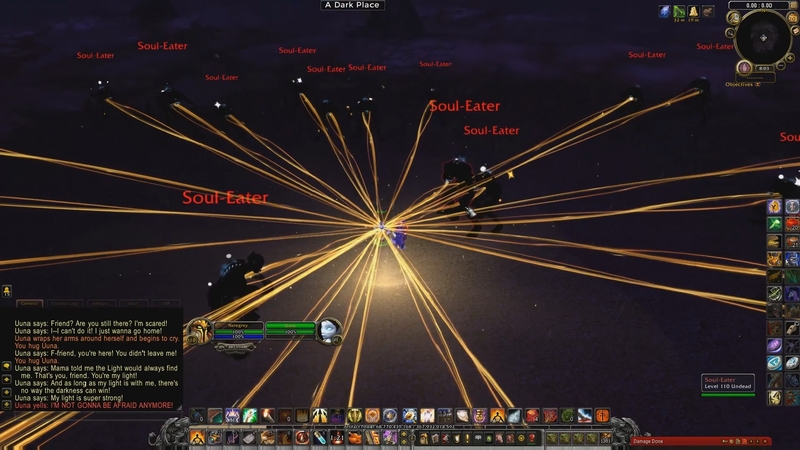 A single Soul-Eater spawns and moves toward Uuna. Go toward it and step on its backbone. The Soul-Eater will flee away a few yards. Keep doing that about 5-6 times until you see a second Soul-Eater spawn to the far right. 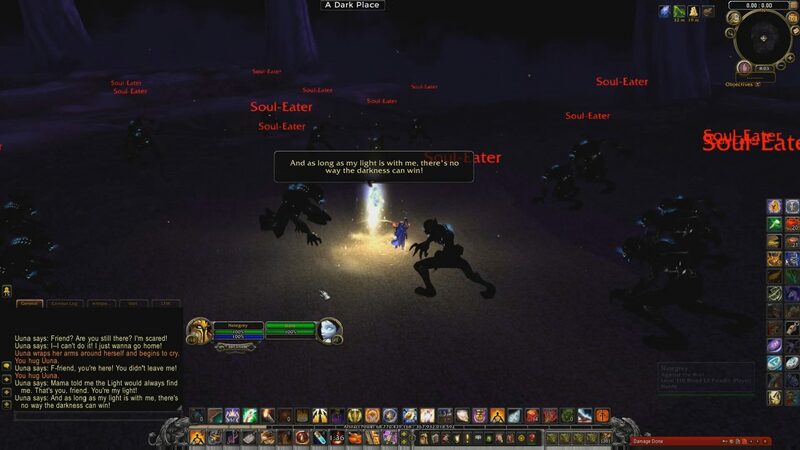 Now several Soul-Eater spawn and start walking toward Uuna. Go clockwise around to step on the Soul-Eater. Make them flee away. 7. After the Soul-Eater go past the darkened circle Uuna is in, she will start shooting her wand at a single target every few seconds to help you. Always try to step on the Soul-Eater closest to Uuna. 8. 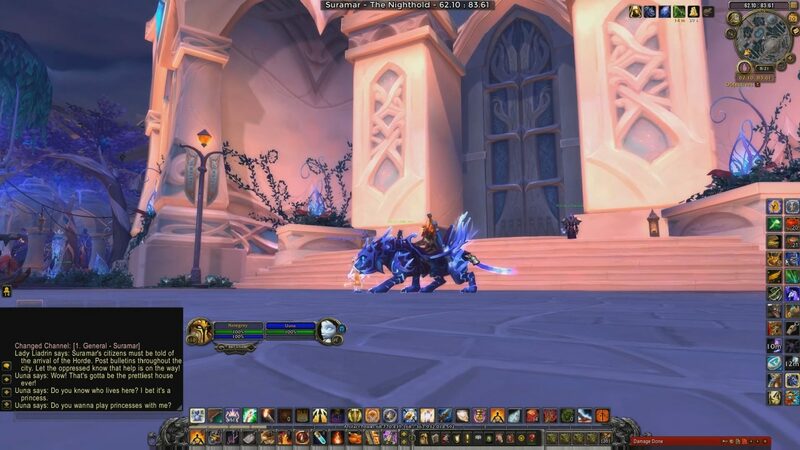 Use your Class Movement Speed abilities such as Sprint (Rogue), Divine Steed (Paladin), Aspect of the Cheetah (Hunter), Power Word: Barrier+Body and Soul talent (Priest), Burning Rush talent (Warlock); or Gear active Movement Speed abilities (such as the Man'ari Training Amulet heirloom) ONLY when the Soul-Eaters are closing in on Uuna -- allowing you to walk on 3-4 Soul-Eaters at a time. This timing is critical for what comes next to win the Scenario. 9. A sign that the end of the scenario is within a couple of seconds happens when Uuna says the following: "Friend? Are you still there? I'm scared! I--I can't do it! I just wanna go home!" 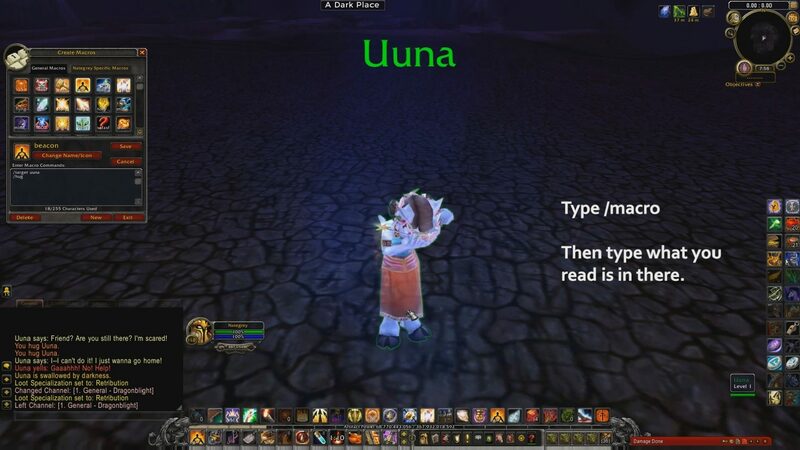 WARNING: Three seconds later, she will emote: Uuna wraps her arms around herself and begins to cry. At that exact moment slap that MACRO button many times. THIS IS WHAT ENDS AND WINS YOU THE SCENARIO. THE MACRO. 10. Uuna says: "F-friend, you're here! You didn't leave me! Mama told me the Light would always find me. That's you, friend. You're my light! And as long as my light is with me, there's no way the darkness can win! My light is super strong! I'M NOT GONNA BE AFRAID ANYMORE!" 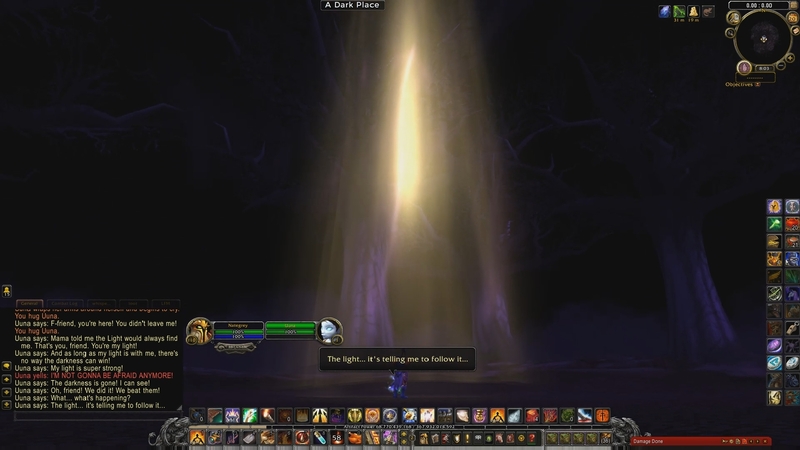 Uuna: "The darkness is gone! I can see! Oh, friend! We did it! We beat them! What... what's happening? The light... it's telling me to follow it... Mama! Papa! They're waiting for me! Wait a sec... There's so much I never got to do. So many places I never got to see... Is it okay if I stay with my friend? For just a little while longer? Friend! The Light says I can stay! Woo-hoo! Tell Mama and Papa I miss them, and... and I'll see them soon! Okay, friend, let's get outta here! We have so many places to go!" You are automatically teleported back to the Emerald Dragonshrine in Dragonblight. The World Tour begins (see the next step: Part 9: Big Wall). 1. In Dalaran, go to your Faction District. 2. Take the portal to Vale of Eternal Blossoms (Pandaria). 3. Fly to the Gate of the Setting Sun in the Vale of Eternal Blossoms. 4. Summon Uuna. Bring her to the Shado-Pan Guard Captain until she talks. Uuna: "Wow! That's the biggest wall I've ever seen! What do you suppose they wanted to keep out? Is it bugs? I bet it's bugs. Yuck! I hate bugs! Ewwwww!!" 5. 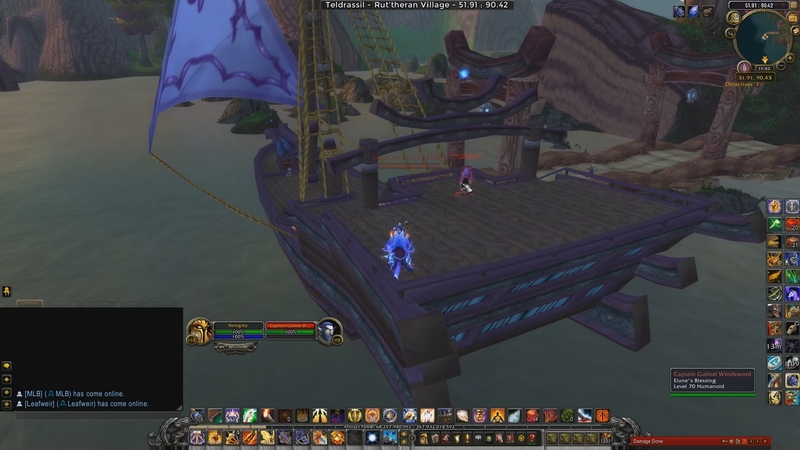 Click the Vindicaar Hearthstone. Then take the portal to Dalaran. Read the next step -- Part 10: Nighthold. 3. Summon Uuna, and bring her to the stairs of the castle's door. Uuna: "Wow! That's gotta be the prettiest house ever! Do you know who lives here? I bet it's a princess. Do you want to play princesses with me?" 4. Fly back to Dalaran. Read the next part -- Part 11: Dalaran. 1. The next part is simple. In Dalaran, summon Uuna. 2. Walk toward the center of Krasus' Landing. Uuna: "Whoa... a flying city! Are you serious?! How does it do that? Do you live here? Come to think of it... do you live ANYwhere?" Read the next step -- Part 12: Wyrmrest Temple. 2. Take the portal to Wyrmrest Temple. 3. Fly to the bottom of the Wyrmrest Temple -- the western-side. 5. Bring Uuna to the Wyrmrest Temple flightmaster: Tariolstrasz until Uuna talks. Uuna: "Hey, what are those flying things? They're so pretty! That's a big tower. It's like a... giant birdhouse! But for lizard birds. Can I have one for a pet?" 6. 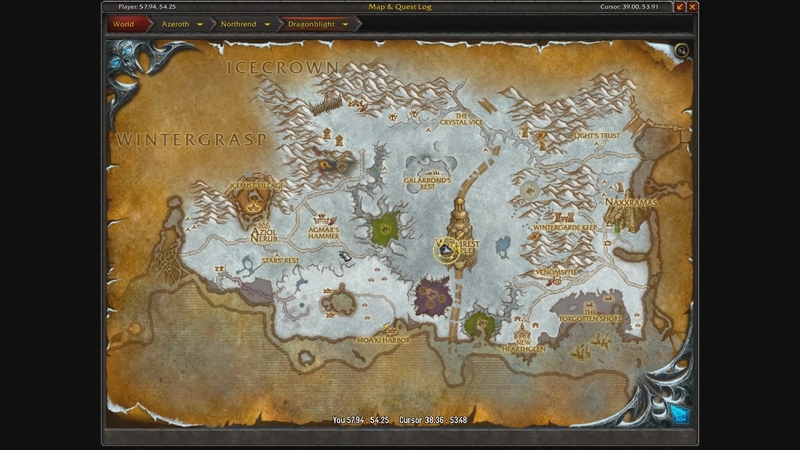 Click the Garrison Hearthstone (Draenor). Read the next step -- Part 13: Hyjal. 1. HORDE: In your Garrison, take the portal to Ashran. 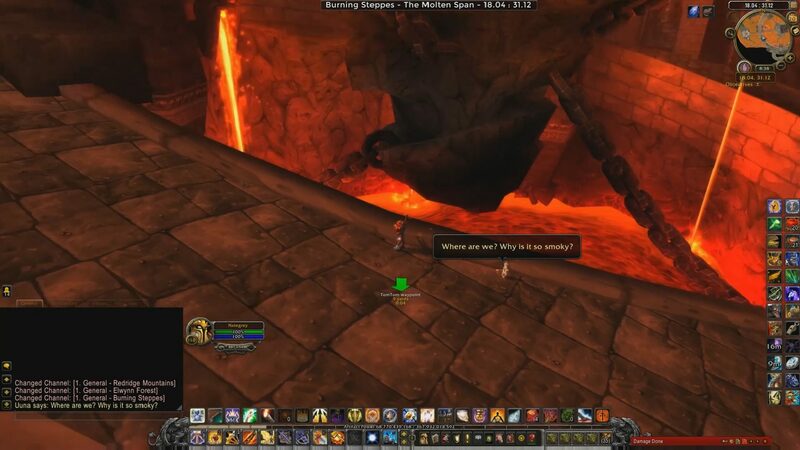 Then take the portal to Orgrimmar. 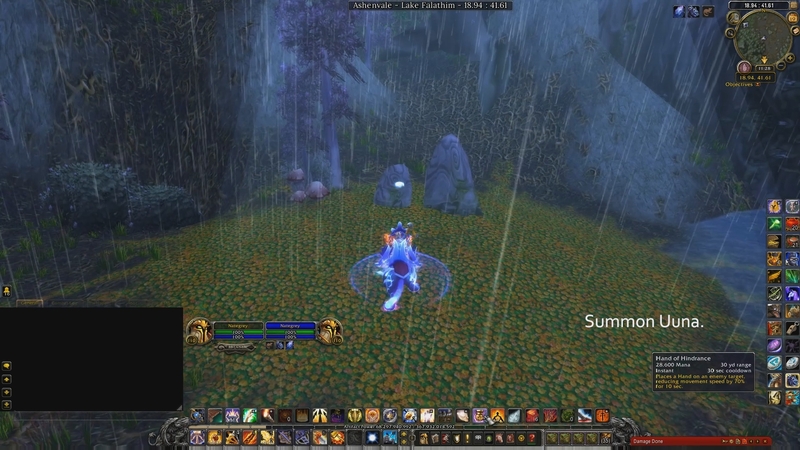 ALLIANCE: In your Garrison, take the portal to Ashran. Then take the portal to Stormwind. 3. 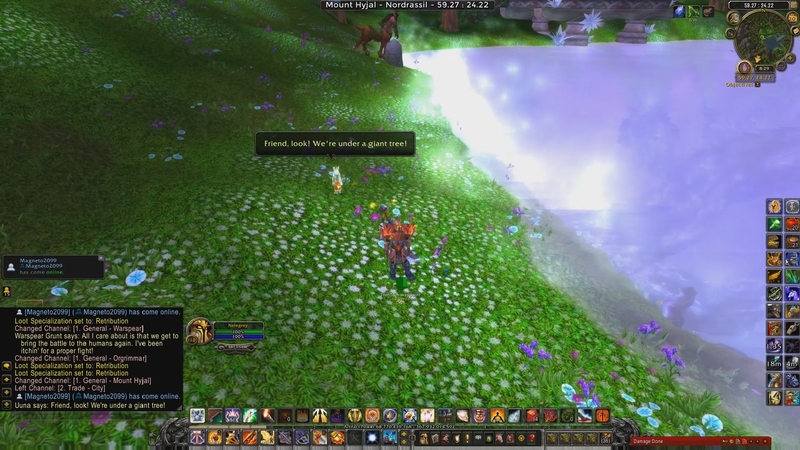 Take the portal to Mount Hyjal. 5. Summon Uuna and bring her to the lake's shore. Uuna: "Friend, look! We're under a giant tree! I wonder how many birds live in that tree. Must be so many! Like... TEN birds! Caw caw caw caw caw!" 6. 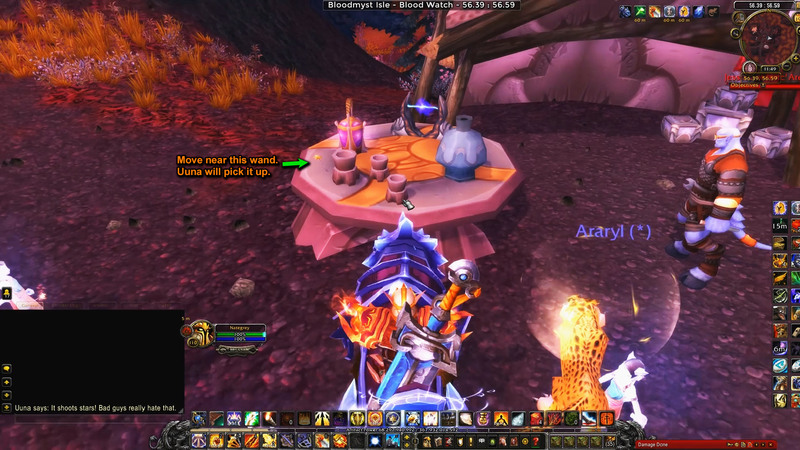 Fly back to where you spawned, at the Nordrassil Inn. 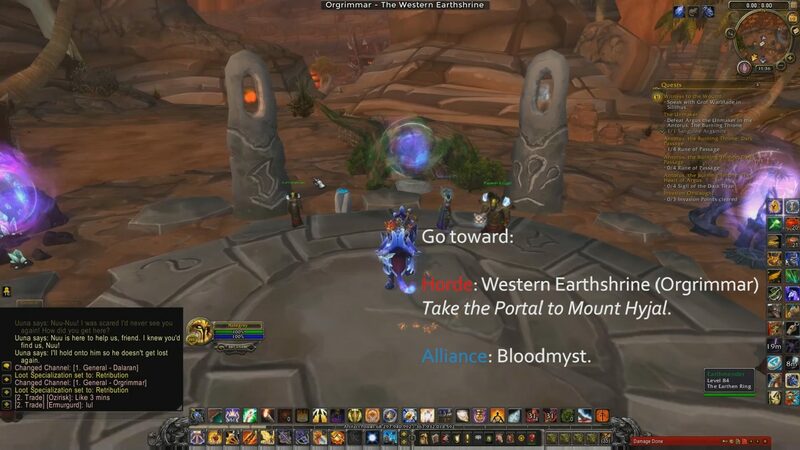 Take the portal to: Orgrimmar or Stormwind. Read the next step -- Part 14: Kun-Lai. 1. 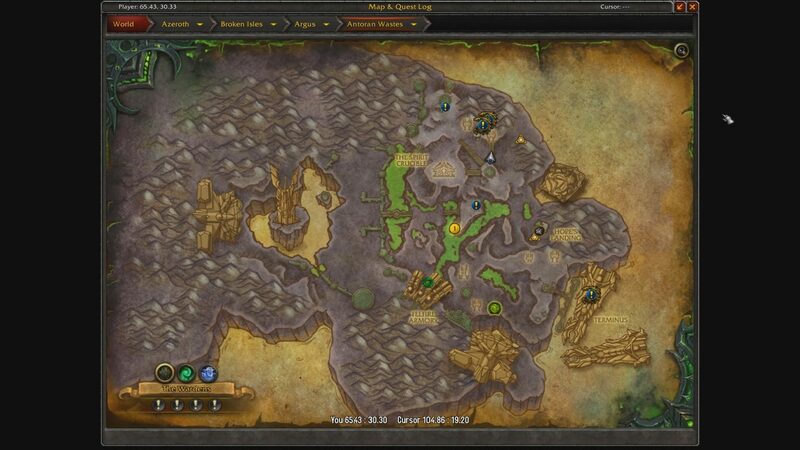 HORDE: In Orgrimmar, fly to the Cleft of Shadows to take the portal to Dalaran. ALLIANCE: In Stormwind, fly to the Stormwind Keep to take the portal to Dalaran. 2. 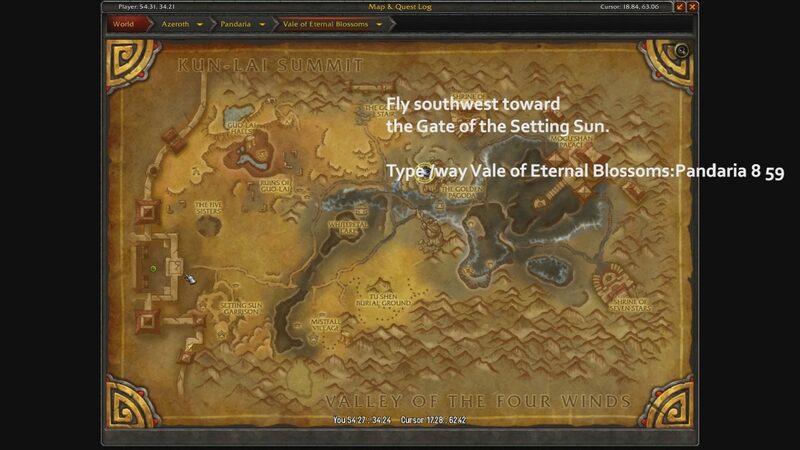 Go to your Faction District to take the portal to Vale of Eternal Blossoms (Pandaria). 3. Fly north toward Kun-Lai Summit. 5. 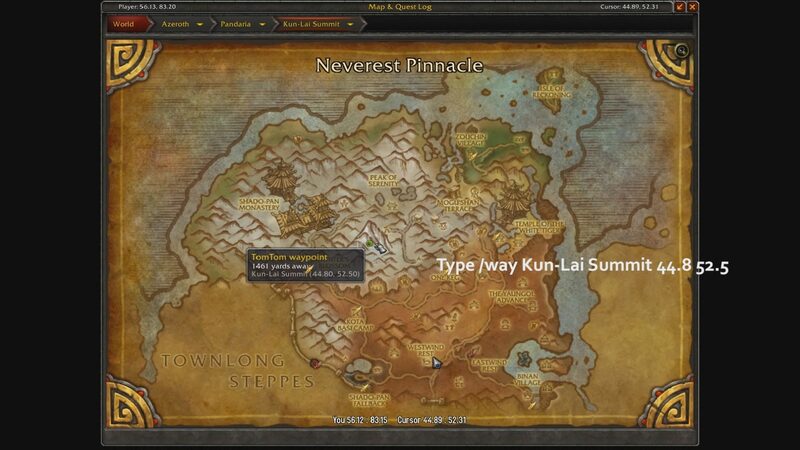 Land at the top of the highest mountain in Kun-Lai, the Neverest Pinnacle, and summon Uuna. Uuna: "I can see everything from here! Don't fall off, friend! I'll be okay if I fall, but you'd go SPLAT! So be careful, okay?" 6. Click the Dalaran Hearthstone. 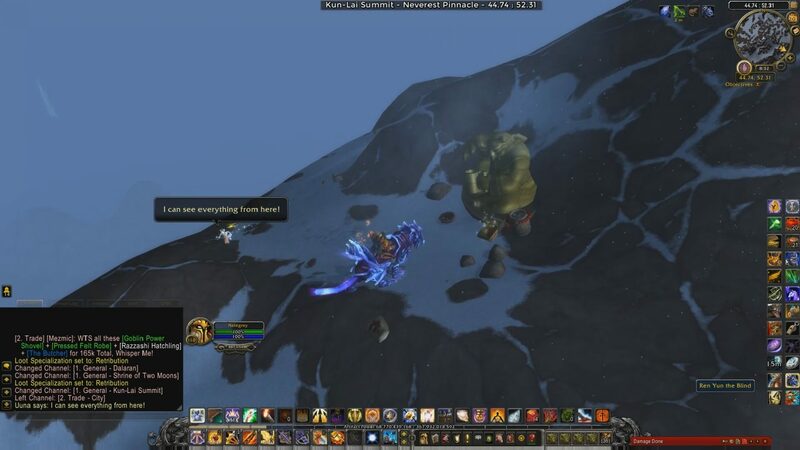 Read the next step -- Part 15: Blackrock. 1. In Dalaran, fly to the Chamber of the Guardian. 2. Take the portal to Karazhan. 3. 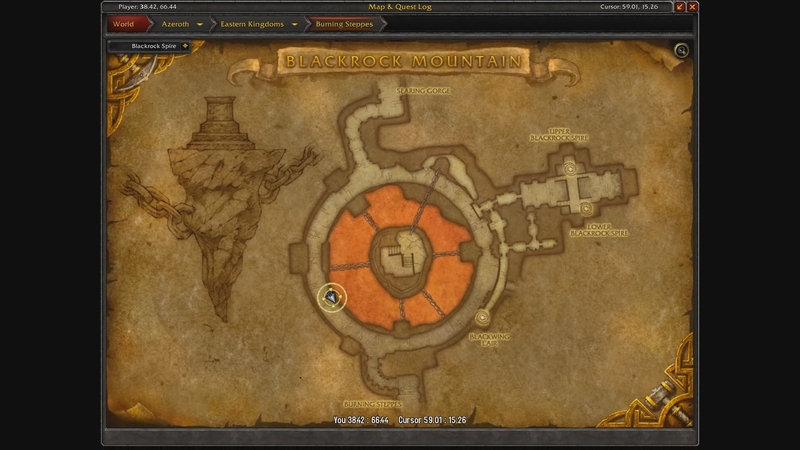 In Karazhan, fly north toward Blackrock Mountain. 5. At the Molten Span (Blackrock Mountain), summon Uuna. Bring her to view the lava pit. Uuna: "Where are we? Why is it so smoky? Look down there. It's all glowing! But it's moving like water... it's a glowing lake? That's really silly, friend." 6. 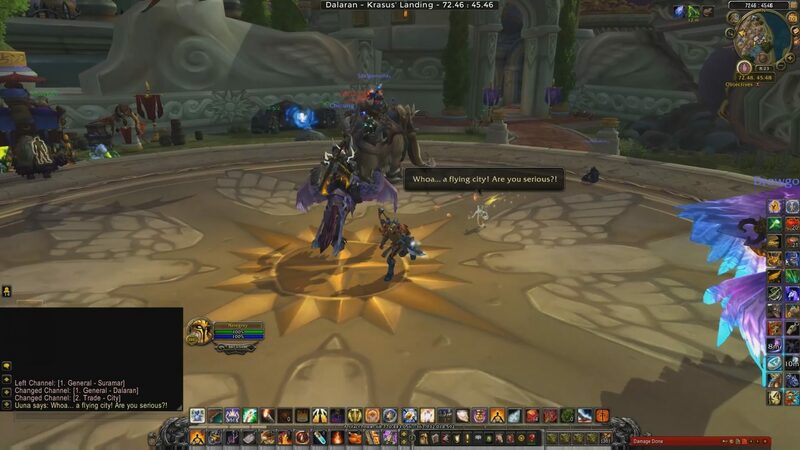 Click the Vindicaar Hearthstone, then take the portal to Dalaran. Read the next step -- Part 16: Karabor. 1. 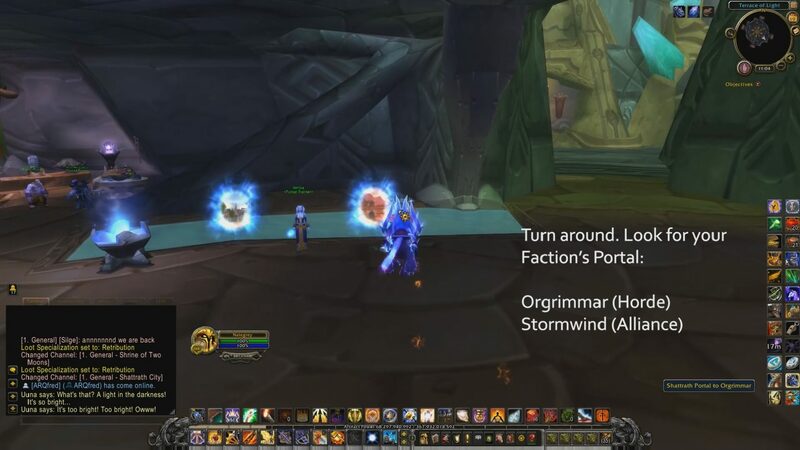 In Dalaran, go to your Faction District and take the portal to: Orgrimmar or Stormwind. 2. ALLIANCE: At the Mage Quarter, take the portal to the Blasted Lands. HORDE: At the Cleft of Shadows, take the portal to the Blasted Lands. 3. Fly to the Dark Portal, and enter. 4. In Ashran, fly west toward the coast of Tanaan Jungle. 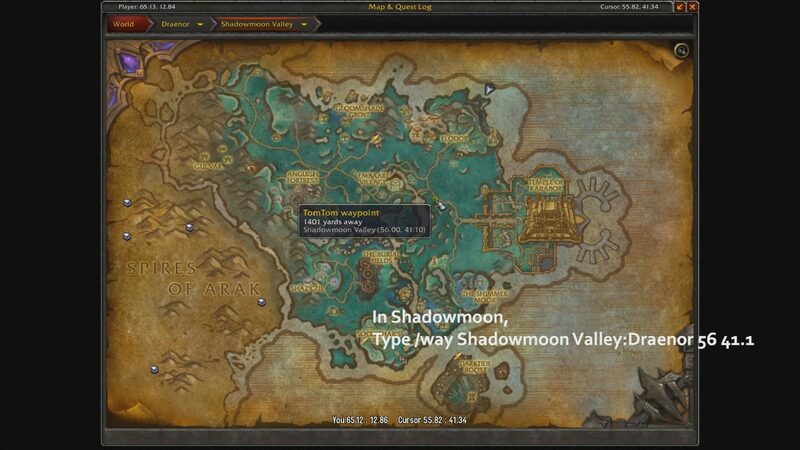 Once there, turn toward the south and fly toward Shadowmoon Valley. 6. Once you get there, land and summon Uuna. Bring her to the spot in the Gardens of Eternity (Temple of Karabor). HORDE: WARNING -- The NPCs in this area flag you for PvP. Move cautiously far from any NPCs. Uuna: "It's... so beautiful... My people are here! They survived! 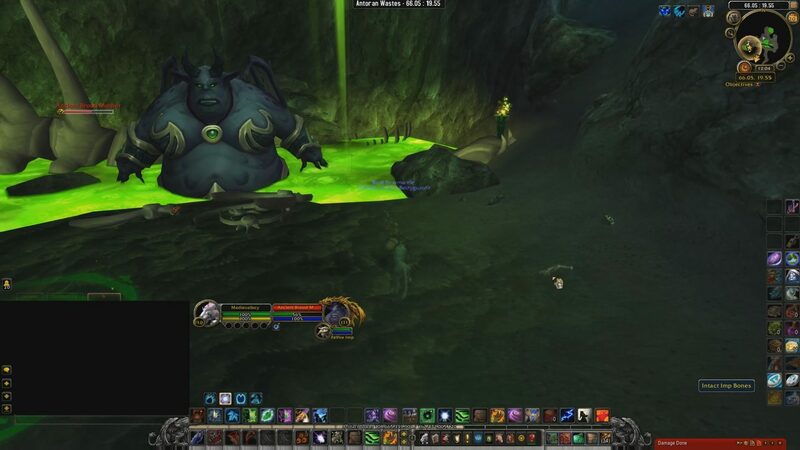 They didn't all die on Argus? Thank you SO MUCH for showing me this, friend! You've shown me so many neat things. You really are the best friend ever! I know someday I'll have to go back to Mama and Papa. But... not yet." NOTE: If you click Uuna and type /hug she will hug you back. There is no achievement or reward for doing all these 16 steps, but the journey and interacting with Uuna is rewarding to those who embark in it. Uuna is account bound. 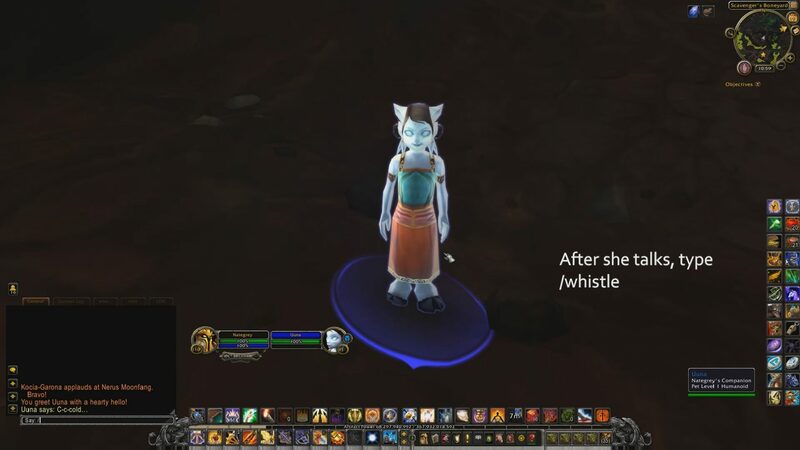 If you loot her and complete this guide as Horde, she can be summoned by your Alliance character and she is wearing the crown, wand, and doll plus she glows with Light shimmers too. 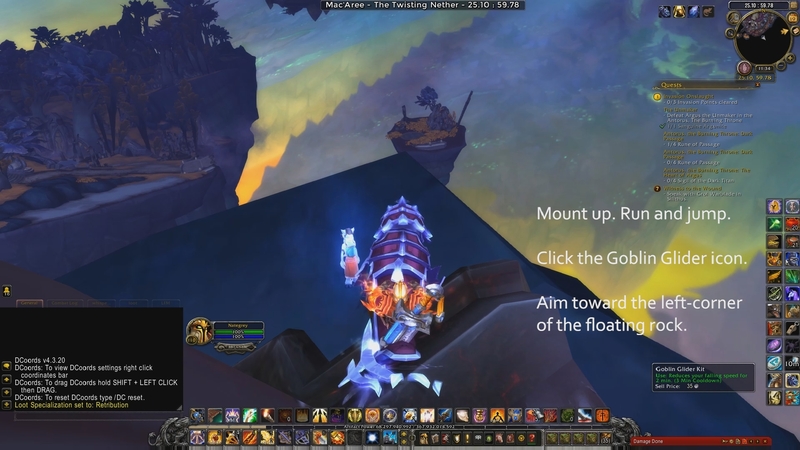 This guide was possible thanks to Secret Finding Discord community, and Nightswifty's Guide.